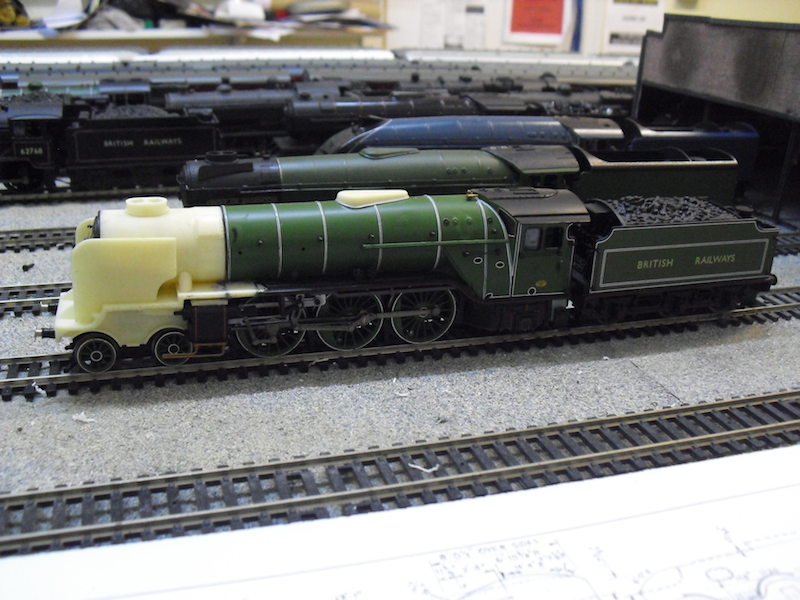 THE BRITISH RAILWAY STORIES LTD: "Thompson A2/1 from a Bachmann V2 & Graeme King Parts"
"Thompson A2/1 from a Bachmann V2 & Graeme King Parts"
Having received the cheap donor Bachmann V2 (Green Arrow in apple green), I proceeded to dismantle the other donor Bachmann A2 as well. The bodyshell and tender of the A2 have been put to one side, as I have a new chassis incoming from a friend who bought an A2 to convert to P4 and didn't want the original Bachmann chassis. 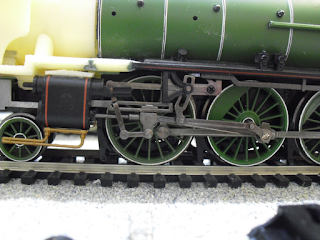 I began by removing the cylinders and valve gear. 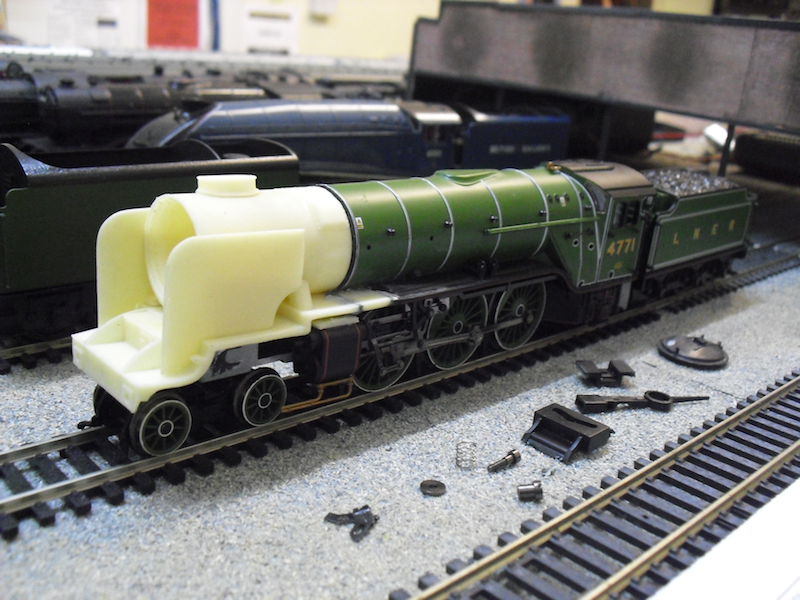 The cylinders were modified by gluing Graeme King's cylinder conversion part on top. I glue this bit first before cutting away the unwanted parts of the A2 cylinders (the frame between them and the bit behind) as this allows for cylinders which are straight and level with one another. 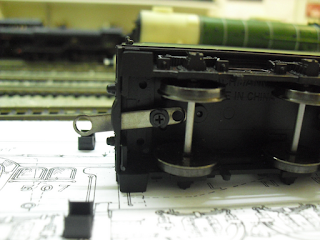 The V2 valve gear can be removed as all one piece from the new Bachmann chassis. 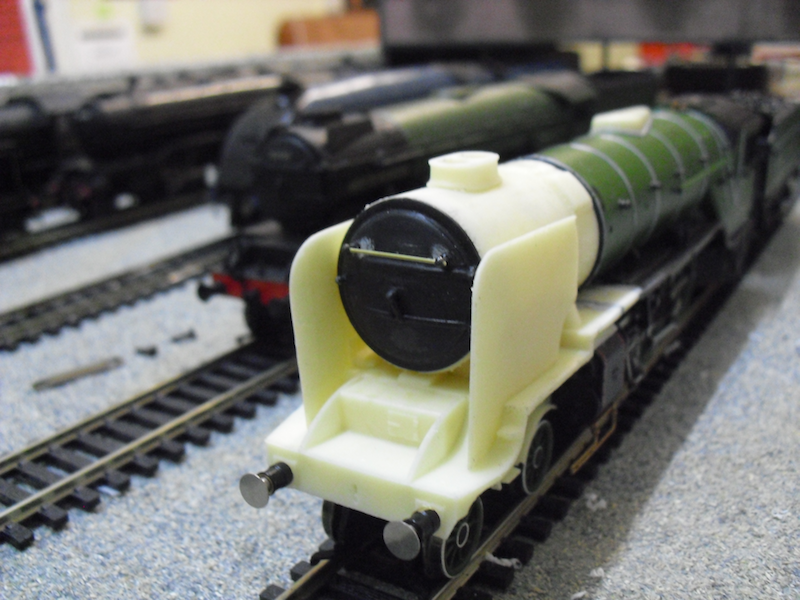 Happily, the original cylinder block of the older split chassis models can be reused (complete with the original valve gear!) so this chassis will not go to waste, instead being put under an older beloved V2 bodyshell, which will be modified in line with my previous V2 conversion. Note that whilst the valve gear retains much of the basic properties of the original V2 models, one significant change has been done to the eccentric and slide bar; these two items are actually designed more or less to fit into the A2 model's cylinders. They will fit without further modification, and with careful pressure from behind. 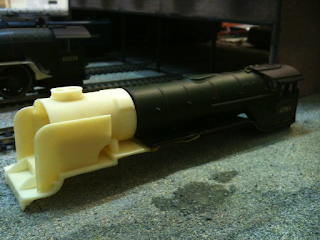 The advantage of filing the chassis in this way is that the attachment point for the tender connector can be retained. However, take note, the whole fixing point for the cartazzi wheels must be removed so that the rear of the bodyshell can fit onto the top of the frames snugly. 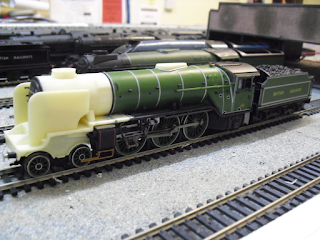 You will notice at this point that the diameter of the Bachmann V2 boiler is slightly larger than that on the Graeme King A1/1 resin smokebox I have used. After some careful filing and filling, this will be barely perceptible, rest assured, as we will see later on. 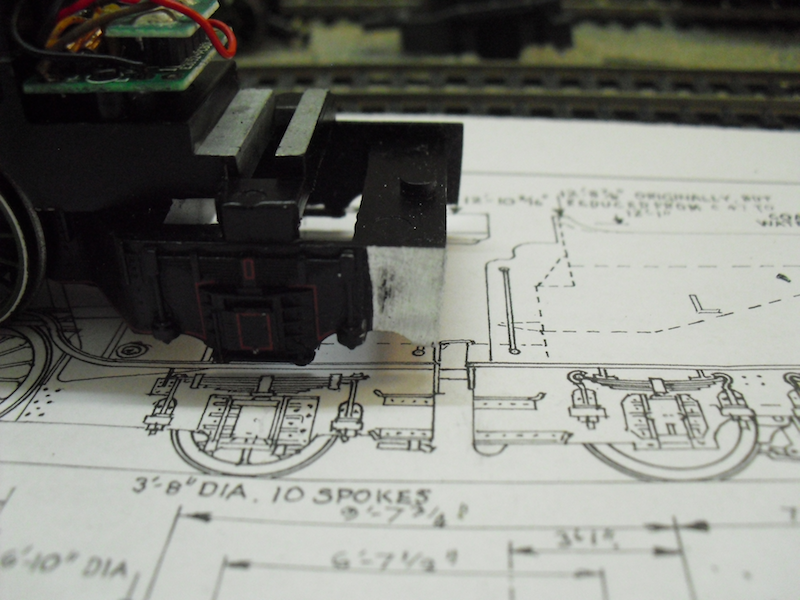 The reason it can be seen here is that the boiler and smokebox had not be glued together yet. Which brings us on neatly onto how I fitted them together. 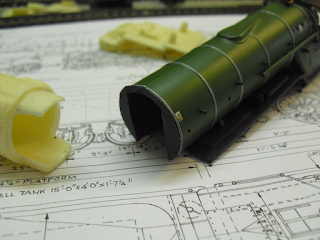 As you can see from the photographs above, cutting the smokebox off the V2 bodyshell gives a U shaped moulding for which the A1/1 smokebox has to be modified to fit. I did this simply by cutting the sides off the moulding's "plug in" section at the rear. With further filing and sanding down, the fit can be made to be very snug, and is bonded simply with super glue. This was the current state of affairs by Friday last week. 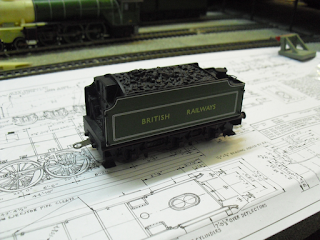 You may notice that you will also need a little bit of extra running plate to fit the V2 bodyshell to the Graeme King A2/3 resin running plate. I kept back a spare slice of resin running plate from my ongoing Thompson A1/1 Great Northern build for precisely that purpose (but more on that build another time). 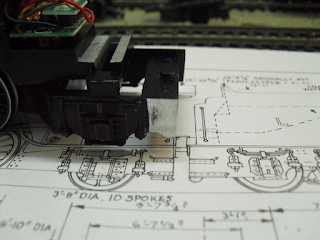 Now for the valve gear! 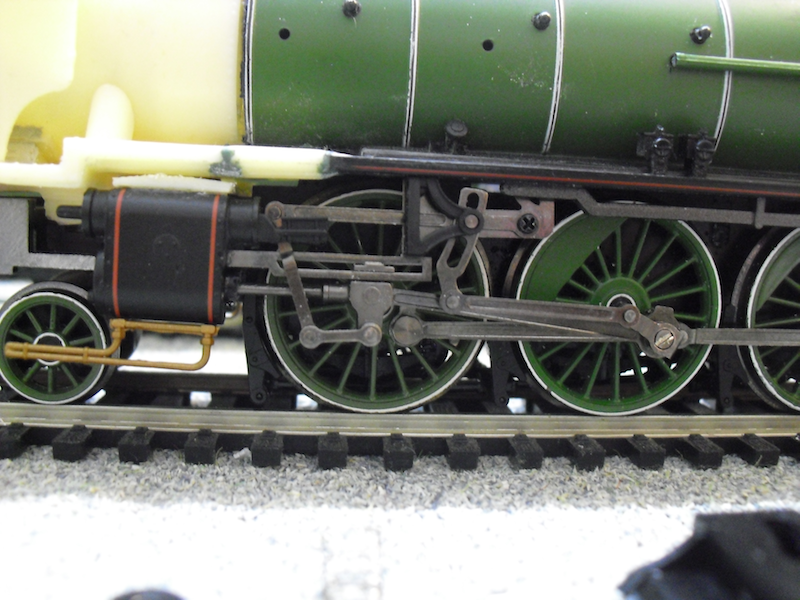 With the cylinders modified and fitted into their slot, I simply slotted in the V2 valve gear, and screwed the centre driving wheel pin back on. 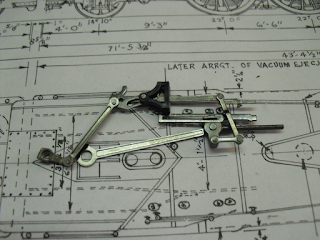 You will need a washer between the driving wheel pin and the connecting rod (my two washers came from a Triang Britannia, which bizarrely had the exact size and depth of washer needed!) 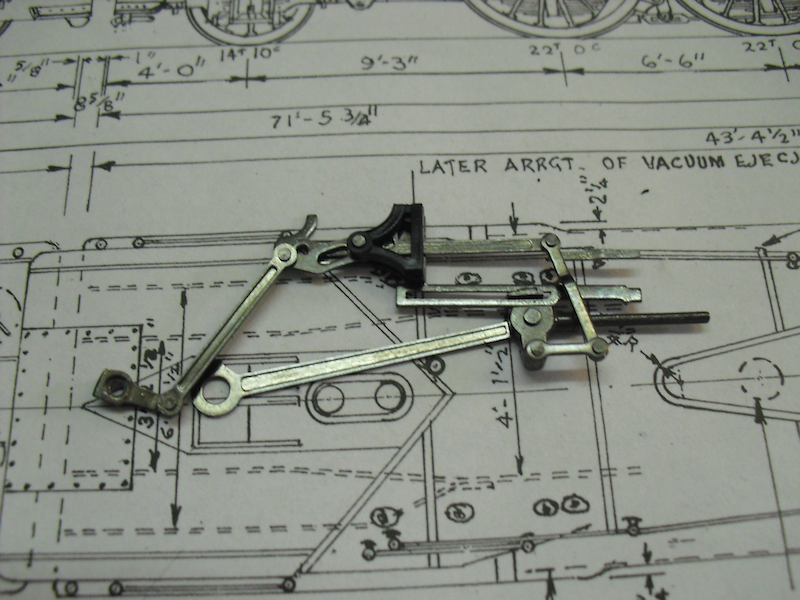 for the V2 valve gear to sit correctly. Some testing, and I discovered that the piston rod was actually hitting the front of the inside of the cylinders on both sides. This requires the slide bar and the piston rod to be shortened a tad, no more than a few millimeters, in order to run smoothly. Aside from that, the valve gear works out of the box without fuss. A win in my books for standardization of components! With the chassis more or less sorted, it was time to turn to the aesthetics again. The original V2 dome was removed through filing and cutting, and one of Grame King's resin A3 type domes added. This really helps to disguise the problems with the V2 boiler (particularly its shape) and is a fundamental factor in my decision to have a go at building an A2/1 from a Bachmann V2 bodyshell. 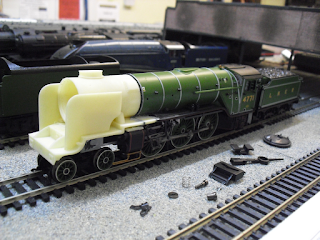 For those who are much more bothered about the V2 boiler (and to be fair to all, I am still bothered about the boiler shape, but less bothered when the correct length and shaped dome is fitted), Graeme is in fact working on more resin parts to produce more accurate A2/2, A2/1 and V2 bodyshells. Watch this space! 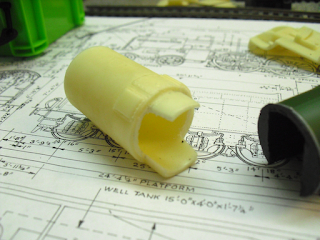 The spare smokebox door (from a Bachmann A1, which is more or less irrelevant as it is identical to the A2 moulding, so it's probably fair to say it's a shared tooling) was given a new handrail and handrail knobs, the step on the lower half removed by scalpel, and the smokebox numberplate (moulded onto the top strap) removed by scalpel and careful sanding down with wet'n'dry paper. 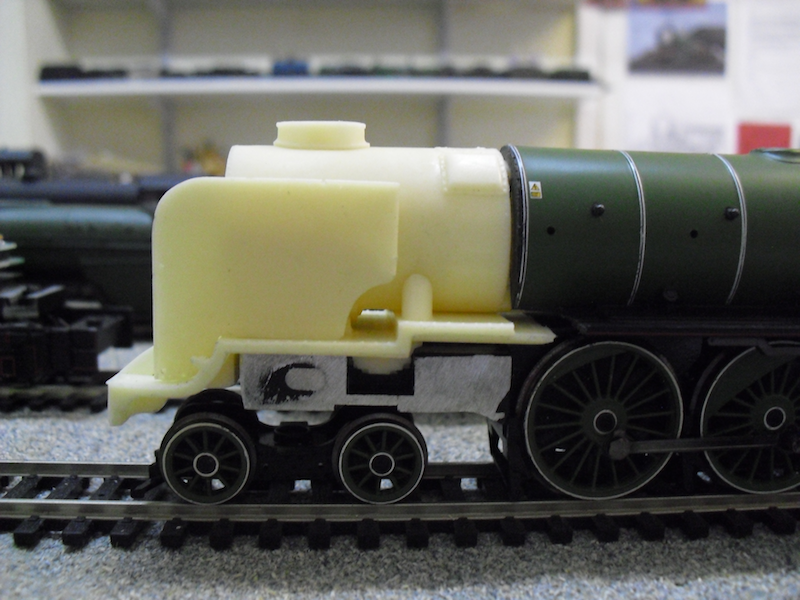 Bachmann's latest B1 model has a new chassis, yet retains the older tender arrangement with the ludicrously large plastic peg. The V2 however had the A1 & A2 style of metal bar with pin on tender designed into it. What is particularly interesting is that whilst on the V2, new frames were tooled up to allow this standard coupling to be used, Bachmann did not take advantage of this new tooling with the B1's tender. 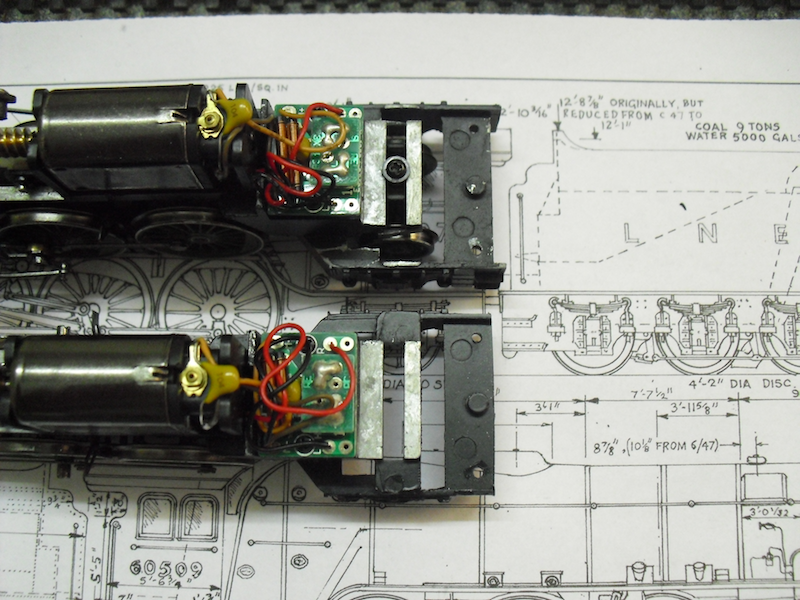 However...the plot thickens, as by unscrewing the V2 tender top, you will discover that the B1 tender simply slots on and has identical mounting points for the tender top and chassis to be screwed together. So my tender is a mix of the newer Bachmann V2 tooling's frames, and the older Replica Railways tender top. So in - what, twenty to thirty years? The original Replica Railways B1 tender hasn't changed much - it can still be swapped about with its V2 counterpart's tender components! I should point out now that the new frames and the old ones are identical in every respect except for the new coupling peg and the rear tension lock coupling (which now uses Bachmann's standard NEM pocket). I decided to take advantage of the peg by making a small adjustment of my own. I have grown increasingly frustrated with the "tender on, tender off" nature of the metal bar and peg arrangement. The tender can uncouple very easily when the model is being placed on the track. The solution for me was simple. I drilled into the centre of the peg, put the coupling bar on, and then put a screw into the peg, with a washer between its head and the coupling bar. Result: no more faffing about trying to get the tender on. This may set a precedent for all of my other models so afflicted with this coupling arrangement; they may be permanently coupled as per this in the future! 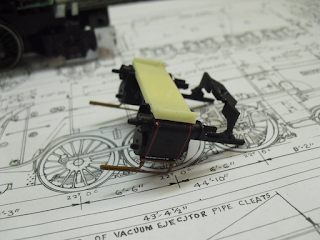 Returning to the chassis briefly, you will remember that I filed down the steps on the rear of the A2 chassis in order to get the correct overall length. The next stage is to add some steps. These plastic ones, currently blue tacked on to check size and shape, are cut from a spare Hornby A3 cartazzi moulding, and should be perfect for this job. I am working on how I attach them, but the general feeling I have right now is that they will be filed down at their rear and glued down to create an almost seamless fit onto the cartazzi's rear. 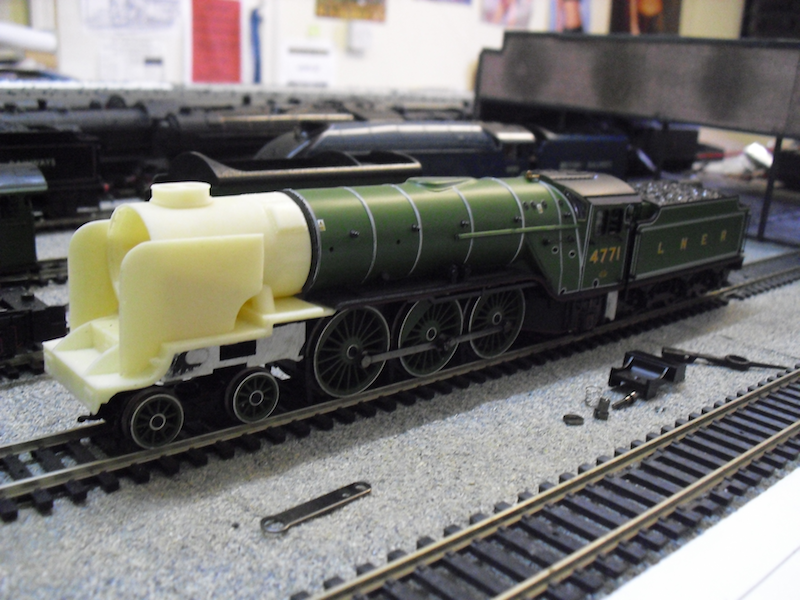 So there we have it: my work thus far on building a Thompson A2/1 Pacific from an RTR V2 and an RTR A2, combined with some of Graeme King's superb resin components. 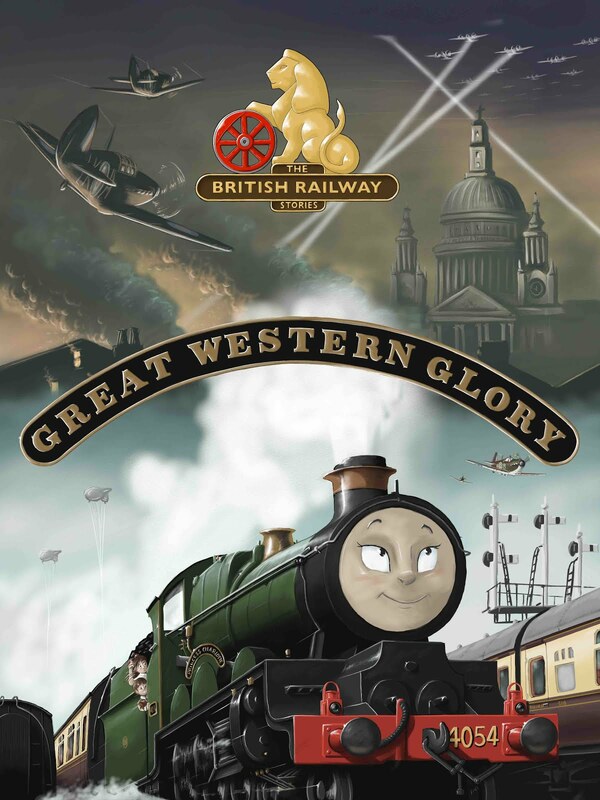 The total cost for building so far has to take into account the £70 and £75 spent on the A2 and V2 (bearing in mind I will recoup some of that money from the sale of the V2 tender top to a P4 modeller I know) along with the various spares I had lying around (smokebox door, A3 cartazzi moulding and similar). The V2 bodyshell has its flaws, there's no doubt, but the superior paint finish (and particularly the apple green, which will need some touching up due to my ham fistedness, but thankfully not much!) 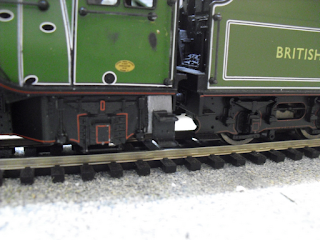 and relative ease of mixing and matching Bachmann components more or less made up my mind on this one. Next time I hope to have completely finished the A2/1, including modifications to the steam pipe, the handrails, addition of deflectors and their handrails, and many more bits and pieces besides.